Tom Has Spirit, Yes He Does. So it turns out Tom sort of, kind of LOVES Christmas. He doesn’t totally get Christmas, but he’s loving everything associated with it this year. Lights! Toys! Trees! Trains! Breakable things! Cookies! Reindeer! Santa Claus! Watching Tom love Christmas has got to be one of the all-time greatest things about being a mom. So addicting, in fact, I think I’ll have another baby next year (a girl, probably) so I can see if she likes Christmas too! While you’re thinking about my good idea, I’m going to give you the reasons (proof!) that the Christmas spirit is strong with my child. 1. 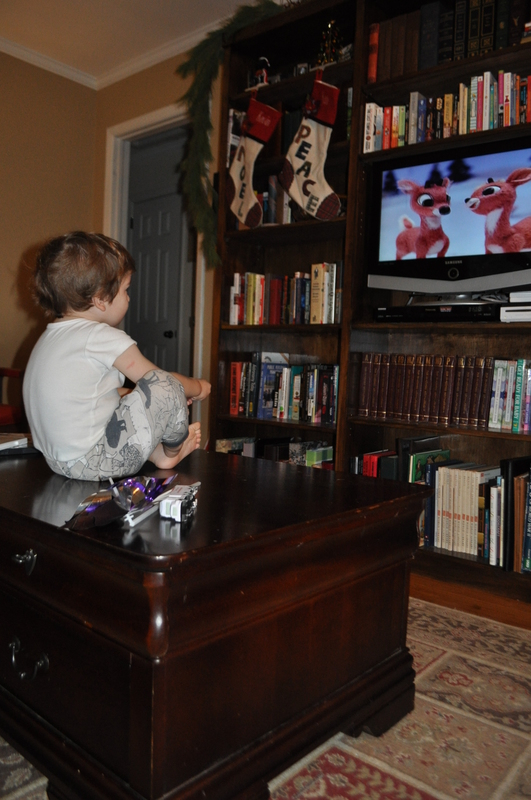 He taught himself to climb onto our coffee table so that he could have a FRONT ROW seat to “Rudolph the Red-Nosed Reindeer” which we watch approximately three times daily, per his request. He’ll say “Reindeers?” and you say, “You want to watch reindeers?” And he says, “O-tay.” He loves the reindeers. LOVES. 2. He decorated his own sticker tree. See, I thought we’d space this activity out a little bit. Add an ornament, put up a little ball, admire our work. And Tom thought that idea was dumb, because he wanted ALL the ornaments and balls and he wanted to put them all up at once and all in the same high-middle point of the tree. And then we admired his work. Which is awesome. 3. 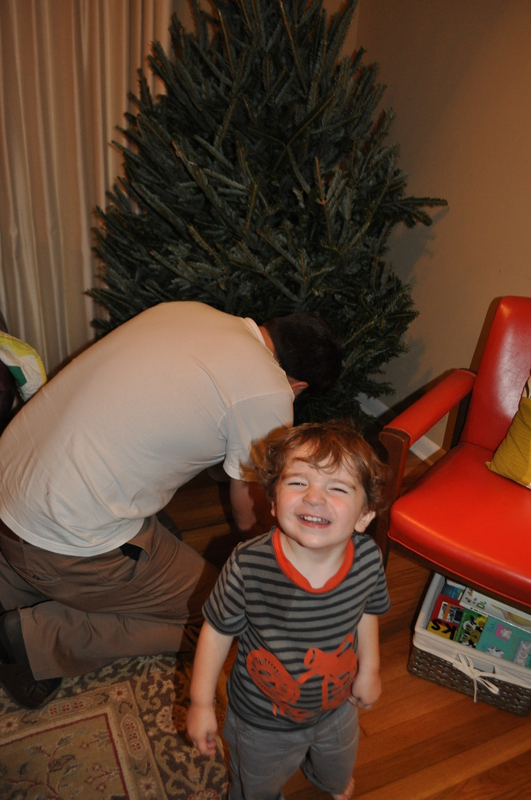 He tried out his new “smile on demand” as soon as we brought our tree inside. I was trying to take a pic of Tom “helping” his daddy put the tree up, but Tom saw the camera and decided he couldn’t contain his Christmas excitement. Little ham. 5. Just getting out the train *box* got Tom in the spirit. He couldn’t wait for Daddy to get this thing out and going. Could. Not. Wait. He admired this box, tried to pry it open himself and then pretty much ran off with every piece as it was unpacked, like a train hoarder. 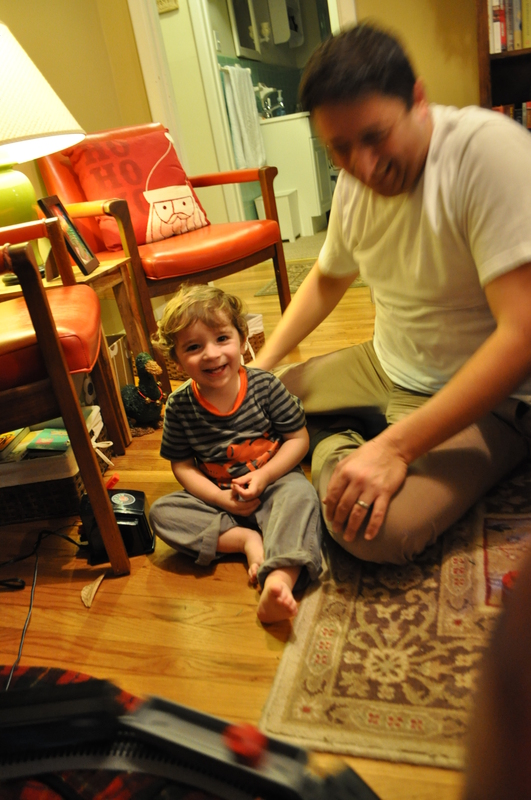 Luckily, we found his stash so we were able to actually put it together. 6. 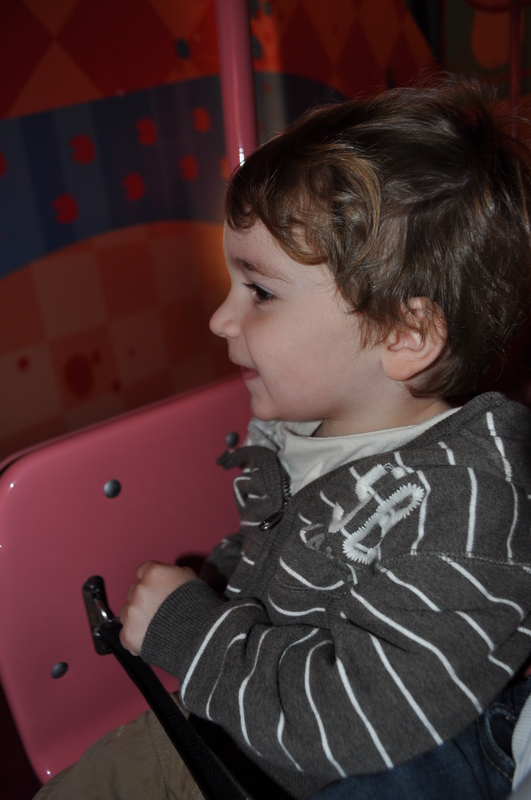 Oh, and then he L-O-V-E-S the actual put-together train. A lot. He loves to “chase” it by crawling back behind the tree and knocking it off the track. (Accidentally, he says.) 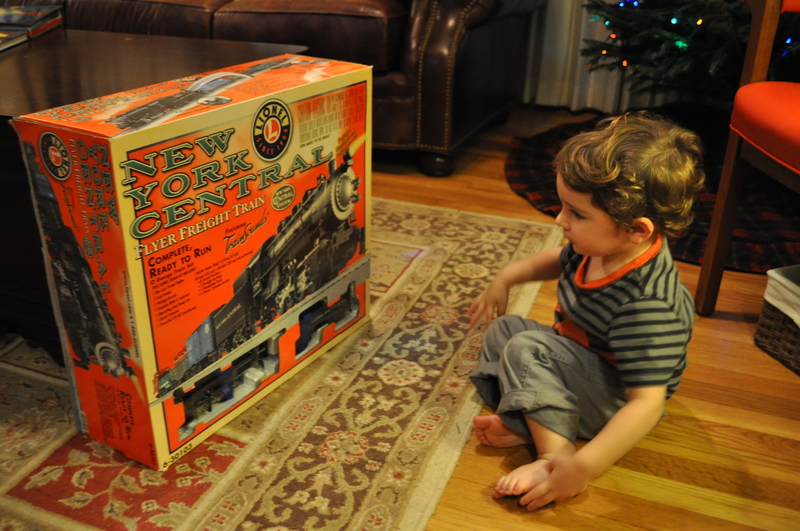 His favorite thing is to put things in front of it for the train to run over, but I think his love of our only-comes-out-at-Christmas train is still Christmasy. In a way. 8. He thinks lights are for wrapping yourself up. Seriously, as soon as I brought the light box down, he’s been dragging them out and wrapping them around himself. 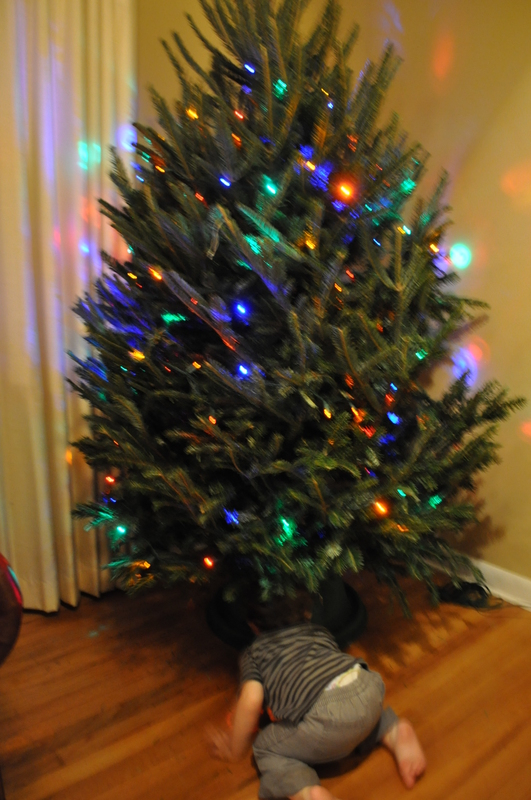 And when we tried to put the lights on our tree this week, he actually stole a set and ran off with them. Which is also what he did when I was putting lights on our porch. 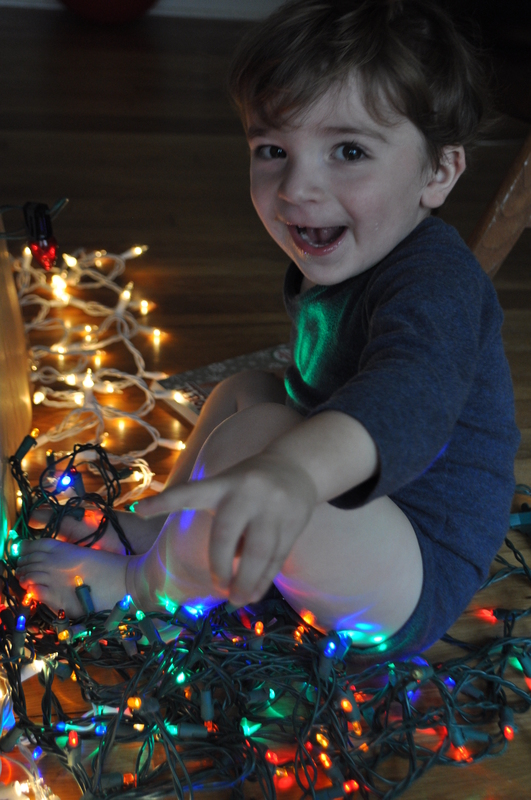 So, I’m going to say he not only thinks lights are for wrapping around himself, but he also thinks it’s a great way to get his parents to play chase. Which is totally correct. Tom hopes you guys are in the Christmas spirit as well. If you’re not, feel free to stop by our house. 5 Responses to Tom Has Spirit, Yes He Does. Absolutely precious. Watching the excitement of Christmas from a kid’s perspective is priceless. Glad you all are making such special memories. The sticker tree is a really neat idea. Adorable, all! And I think I’ve said this before but…your bookcase is to die for. LOVE. He is just so darn cute! 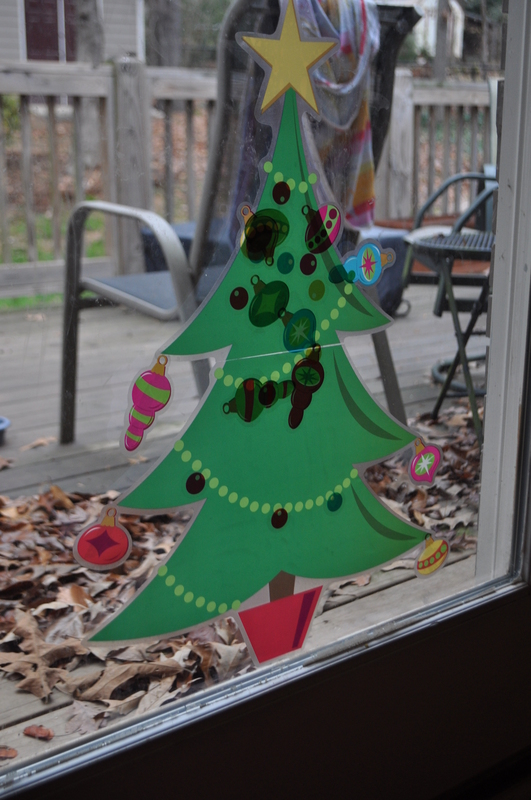 Love the sticker Christmas tree idea, even though our granddaughters are pretty much past that age. He does look REALLY happy. Can’t wait to see y’all this weekend!